The Multitank System comprises a number of separate tanks fitted with drain valves. Two of the tanks have varying cross sections. These introduce nonlinearities into the system. A variable speed pump is used to fill the upper tank. The liquid outflows the tanks due to gravity. The tank valves act as flow resistors. The area ratio of the valves is controlled and is used to vary the outflow characteristics. Each tank is equipped with a level sensor. The general objective of the control is to reach and stabilize the level in the tanks by an adjustment of the pump operation or/and valves settings. This control problem can be solved by a number of level control strategies ranging from PID to adaptive and fuzzy logic. 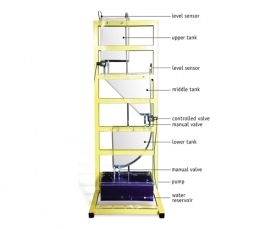 The Multitank System is designed to operate with an external PC-based digital controller. The computer communicates with the level sensors, valves and pump by a dedicated I/O board and the power interface. The I/O board is controlled by the real-time software which operates in the MATLAB/Simulink RTW/RTWT environment. A dedicated library of controllers and Simulink models support the Multitank system.